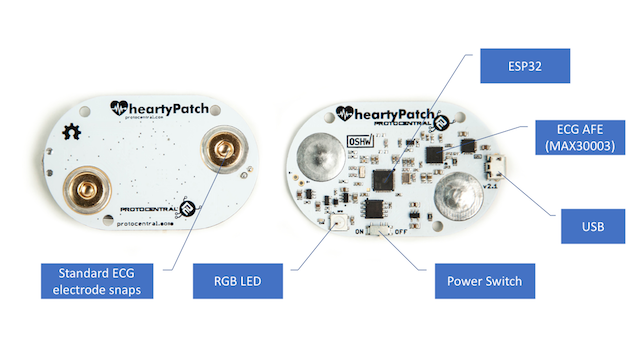 HeartyPatch is a completely open source, single-lead, ECG-HR wearable patch with HRV (Heart Rate Variability) analysis. It is based on the popular ESP32 system-on-a-chip. If you don’t already have one, you can buy one on our Crowd Supply campaign page. We have started shipping them out to backers. 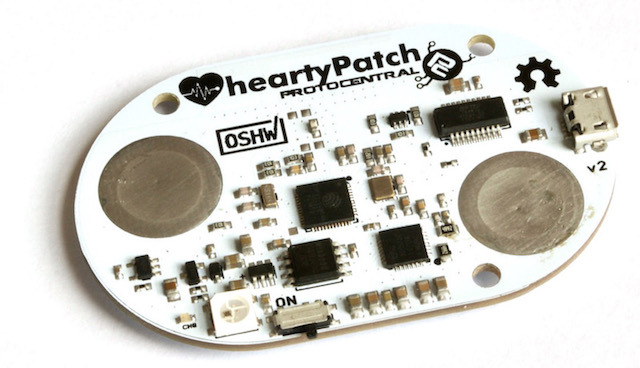 If you just want to use the HeartyPatch with the pre-loaded firmware, it comes ready to go. You do not have to do any programming to get it working. The pre-loaded firmware send HRV values over BLE. 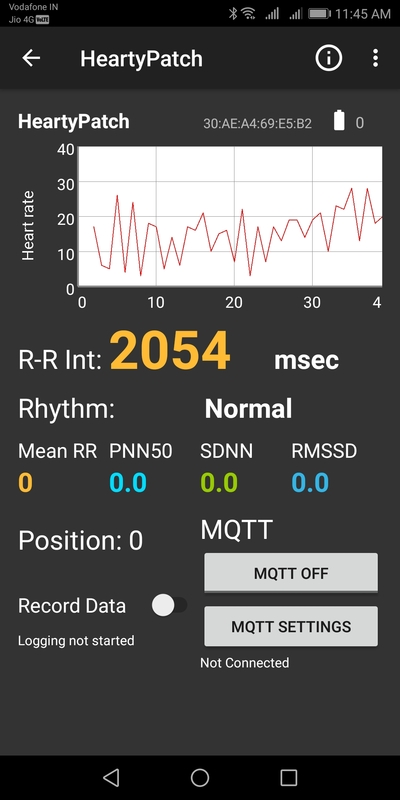 An android app for HeartyPatch is now available that receives and displays the real-time heart rate as well as HRV trends and variables. The app scans for any HeartyPatch devices in the vicinity and shows a list of devices accessible through Bluetooth Low Energy (BLE). Please note that you would need an Android device with BLE support to use this app. Note: The android app for HeartyPatch is still in BETA and there might be some instability as a result. Note: HeartyPatch can also be used with any Android app that supports the heart-rate profile. 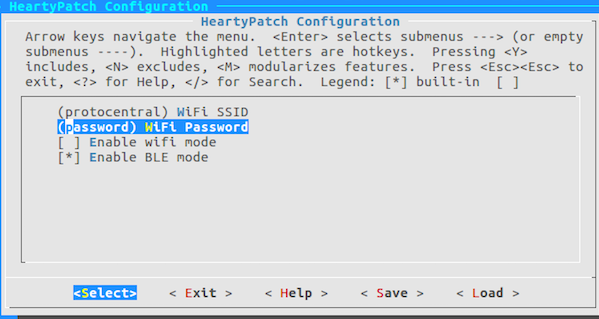 HeartyPatch at any time can work in only ONE of the following modes. Wi-Fi and BLE do not work together as of now. With the preloaded firmware, the HeartyPatch will do heart-rate and R-R interval measurement and send it over BLE through a standard Heart-rate BLE service, as well as a separate custom HRV service that will provide parameters used for HRV analysis such as SD, Mean RR, PNN50 and SDNN. The HeartyPatch can also do live ECG streaming from the chest. This works similar to a heart-rate monitor. Below is a screen capture of the device working in ECG mode. 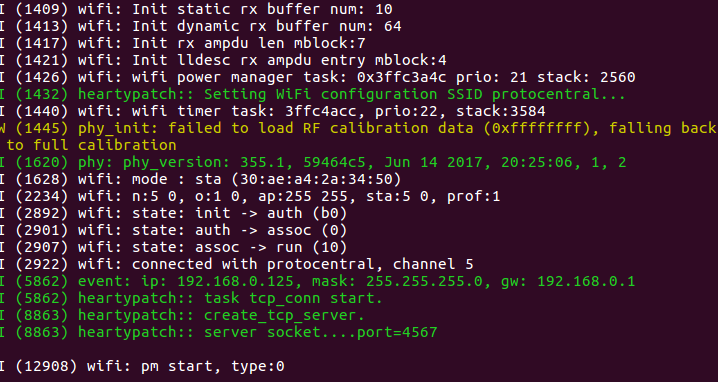 The data is sent over a TCP socket over WiFi. To get the WiFi mode turned on, you will have to flash a different firmware onto the device. It is important to always keep your firmware up-to-date for best results. We keep adding changes, bug fixes and enhancements as and when we do updates. HeartyPatch will continue to be developed and new features added. This version of the esp-idf compiles well only with the toolchain version 1.22.0-61-gab8375a-5.2.0. The v2.1 release of esp-idf The current version of the HeartyPatch code compiles well and performs well only with v2.1 of the ESP-IDF and version 1.22.0-61-gab8375a-5.2.0 of the Xtensa toolchain. 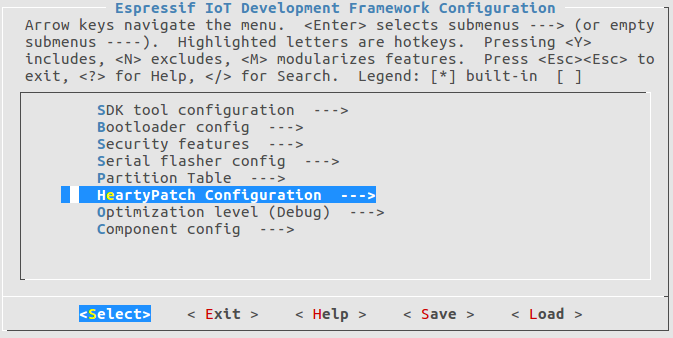 Setup guides for these components are available on the ESP-IDF documentation site. or download a zip file of the latest master branch. Download this zip file, rename it to whatever you want to. Change to this directory and then start building. Please make sure that correct version of all of the above tools are installed before proceeding. 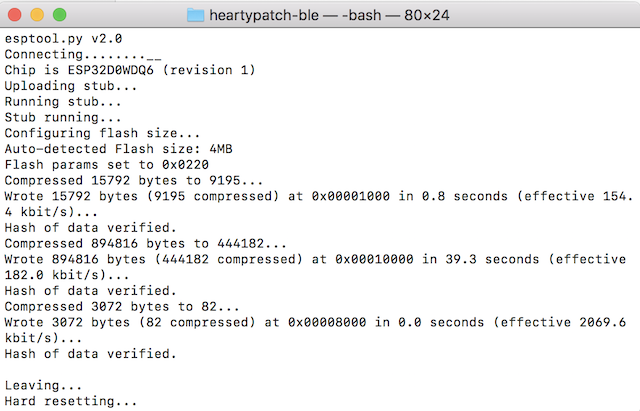 The folder “heartypatch-ble” in the “Firmware” contains the code for the preloaded firmware on the HeartyPatch, which calculates R-R interval, heart rate and time domain parameters for HRV analysis and sends them through BLE. The folder heartypatch-stream-tcp contains the code for streaming ECG. 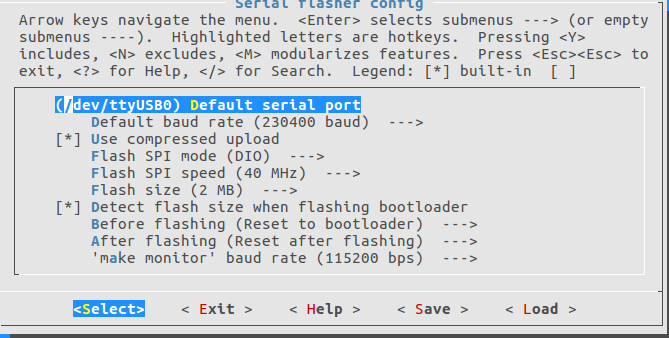 Before flashing this code, enable wifi, TCP and mdns through makemenuconfig similar to the process described in the previous section. 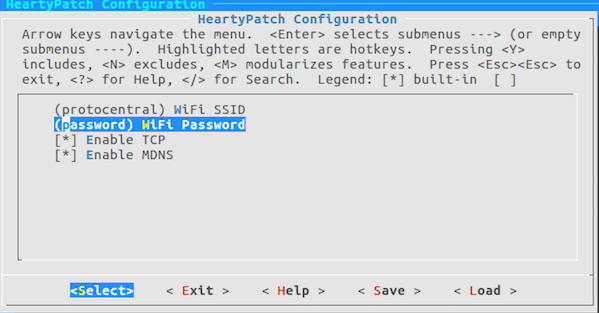 Once the heartypatch is connected with the wifi, open the gui from the project folder and you should be able see the ECG stream. More information about this process and the ESP32 framework is available in the ESP32 Get Started Guide. The HeartyPatch is now configured as a TCP sever ready for connection from a TCP client. The HeartyPatch sends data out in the following packet format. You can download the ProtoCentral TCP client GUI for your platform from the following link. Why is the heart-rate not stable? There’s always variation. Do not worry, that’s what is Heart-rate variability and HeartyPatch displays real-time beat-to-beat heart rate. Heart-rate is supposed to vary from beat-to-beat. How do I get the full ECG signal from the device? I have problems getting the code to compile. What do I do? Help, there is not LED flashing on the device. By default, the LED would not flash. This is done to conserve battery power. This can be enabled in the software though. Why is the ECG signal too noisy? Contact is key. Make sure that the electrode pad is fully flat on the body and it is positioned properly. Do not use the HeartyPatch on the body while it is connected to the USB cable. Always remove the cable before wearing the HeartyPatch. A common source of noise is dry skin. Dry skin does not give good electrical conductivity. Do not re-use ECG electrodes. The quality of contact would reduce with each use. We will continue to add to this list based on user input, so please check this list if something goes wrong. All hardware is released under Creative Commons Share-alike 4.0 International. All software is released under the MIT License(http://opensource.org/licenses/MIT). Please check LICENSE.md for detailed license descriptions.